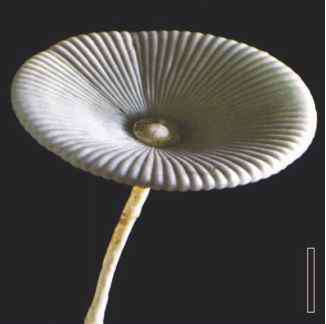 Triploporellaceae (Ordovician-Eocene) (FIG. 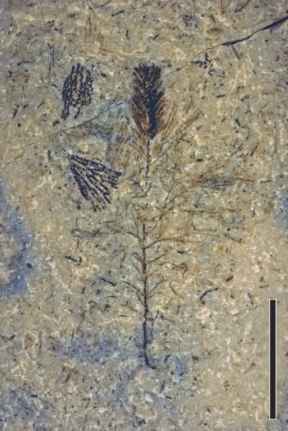 4.8), the Dasycladaceae (Jurassic-recent), and the Acetabulariaceae (Carboniferous-recent) (FIG. 4.9). In addition, a sixth family, the Beresellaceae (Late Devonian-Permian), has traditionally been placed in the Dasycladales (Deloffre, 1988), but Berger and Kaever (1992) regarded this family as a heterogeneous group of organisms that does not belong to the order Dasycladales and may not even represent algae ( Table 4.1). Adams and Al-Zahrani (2000), however, retained the Beresellaceae in the order Dasycladales and reported on Kamaena khuraisensis from Saudi Arabia, a form that extends the fossil record of the family into the Late Jurassic (Kimmeridgian). TABLE 4.1 Geologic range of dasycladalean families. Source: From Berger and Kaever (1992). wide and are composed of an unbranched, parallel-sided central axis surrounded by various projections. The slender, unbranched projections terminate sharply, without rounding or tapering, and are arranged as discrete whorls around the axis. Other Paleozoic genera interpreted as uncalcified dasycladaleans include the Silurian genus Heterocladus (FIG. 4.10 ) (LoDuca et al., 2003), Medusaegraptus, which ranges from the Ordovician to the Silurian (LoDuca, 1990), and the Devonian Uncatoella (Kenrick and Li, 1998). 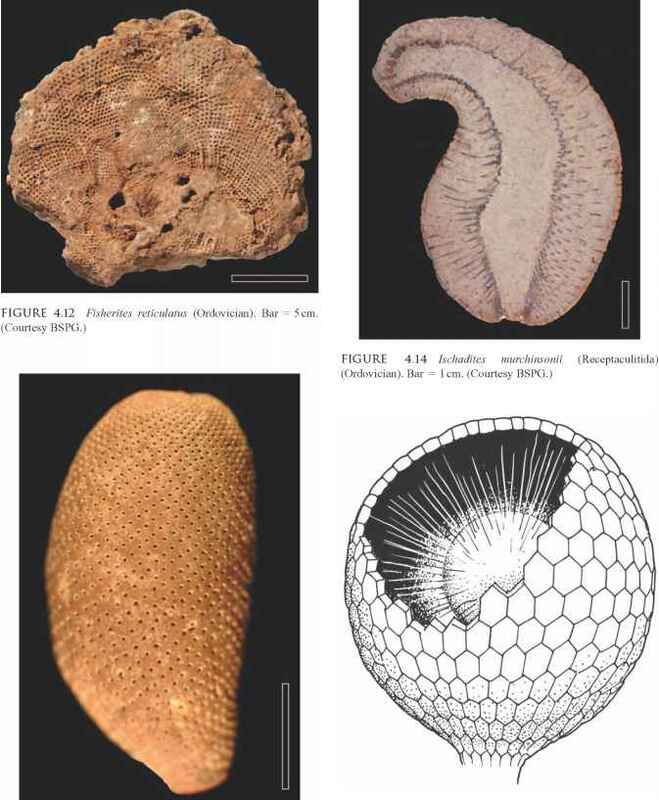 and Plexa from the Ordovician of China (Riding and Fan, 2001), and Rhabdoporella of probable Late Ordovician age (Riding, 2001). Studies by Elliott (1978) suggest that the fossil dasyclads occupied environments similar to their modern counterparts and that their adaptations to specific microenvironments (e.g., salinity, bottom sediment, attachments, and water energies) are essentially similar to those of the extant forms. In general, calcareous algae are scarce in the Early Ordovician, becoming diversified from the Middle Ordovician onward. Since they are associated with warm-climate carbonate sedimentation, none are known from Gondwana during the Ordovician, except in Australia, which occupied a low paleolatitude at that time (Poncet and Roux, 1990). In the Paleozoic and Mesozoic dasyclads, the primary whorled branches are irregularly positioned. These, in turn, bear secondary and tertiary laterals. Most were cylindrical plants, although some were club-shaped, spherical, or shaped like a string of beads (Bassoullet et al., 1977). The thallus was attached to the substrate by simple rhizoids. In the fossils, the encrusting calcium carbonate is sometimes so thick that several orders of branches are covered. A slightly different morphology is apparent in Primicorallina (Seletonellaceae; Ordovician). Specimens of this dasyclad have a remarkably narrow central axis with three orders of laterals in lax arrangement (Berger and Kaever, 1992). Another form that extended from the Ordovician into the Lower Carboniferous is Rhabdoporella (Seletonellaceae), a type that produced only primary laterals, each of which were slightly clavate or terminally expanded. This genus, along with Dasyporella and Vermiporella, has been suggested as representing a primitive form or early evolutionary stage in the dasyclad algae (Herak et al., 1977). More highly evolved members are interpreted as containing a larger number of whorls and more orders of branches. Pianella is a small (3 mm long) dasyclad with funnel-shaped branches arranged in alternating whorls. This taxon is common in the Early Cretaceous of the Middle East, Italy, and the former Yugoslavia. Mizzia is a Permian dasyclad in the family Triploporellaceae that is found shelfward of the Capitan reef complex of southeastern New Mexico (Kirkland and Chapman, 1990). The modern analog of Mizzia is Cymopolia, which extends from the Cretaceous to the recent. Lithologic evidence suggests that Mizzia grew in water that was shallow, warm, and only slightly agitated, subsequently becoming hypersaline. The study by Kirkland and Chapman (1990), involving the distribution of Mizzia in time and space, uses this genus as an indicator of paleoenvironment. 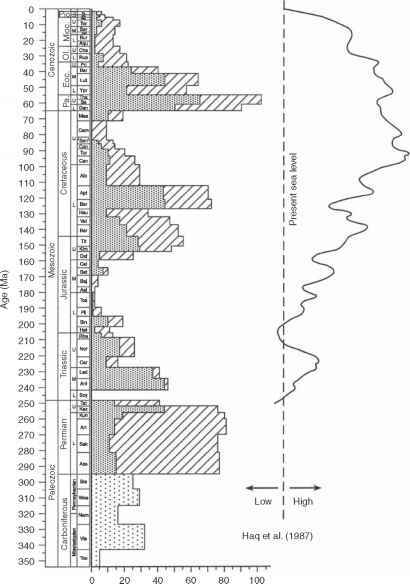 More recently, long-term patterns of dasycladalean biodiversity over the past 350 myr (Carboniferous-Pliocene) were compared to global fluctuations in temperature and sea level. It appears that, in general, diversity peaks occurred when warm, shallow seas were most extensively developed on the Earth (FIG. 4.11) (Aguirre and Riding, 2005). Two other groups of Paleozoic calcium carbonate-depositing organisms that are known from fossil examples are the recep-taculitids and cyclocrinaleans, which are often considered to be related to one another because they display comparable morphological architectures. Both groups have been classified among various higher-level taxa, including corals, bryozoans, and particularly sponges and algae. The latest interpretation is that receptaculitids are neither sponges nor algae (Riding, 2004), while cyclocrinitids (FIG. 4.7) represent a problematic group of algae, possibly a sister group to the Dasycladales (Nitecki et al., 1999). Members of the order Receptaculitida occur in the fossil record from the Ordovician to the Carboniferous (FIGS. 4.13; 4.14), and perhaps into the Permian (Nitecki, 1972; Nitecki et al., 2004). Although they are typically found associated with coral reefs, they are not regarded as reef builders. 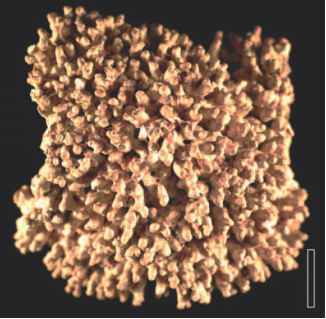 One of the most common representatives of the receptaculitids is the Ordovician Fisherites reticulatus (Finney et al., 1993), sometimes called the sunflower coral (FIG. 4.12) . This organism is spherical or cup shaped, <30 cm in diameter, and composed of a central axis from which radiate numerous, spindle-shaped lateral branches (meroms or meromes). Each merome bears a terminal rhomboidal element ( FIG. 4.12 ), which together form a surface pattern of facets that resembles the arrangement of ripe achenes in a sunflower capitulum (inflorescence). The order Cyclocrinales displays a narrower stratigraphic range, extending from the upper Middle Cambrian to the Lower Devonian (Nitecki et al., 2004). Cyclocrinitids existed in communities at depths of 100 m of water. Cyclocrinites is a common Silurian form with a club-shaped central stem and radiating primary branches (FIG. 4.15). 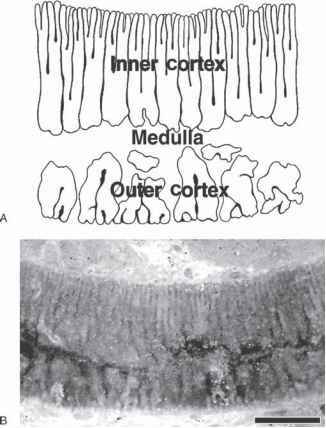 At the end of each primary branch shaft are bowl-shaped cortical cells with flattened tops that in turn merge to form a reticulum of hexagonal plates on the outer surface perforated by regularly spaced holes. Halimeda (Caulerpaceae) is a calcified green alga that is widespread today and important as a structural component of many Cenozoic-recent reefs; the genus is estimated to be responsible for ~25-30% of the CaCO) in Neogene fossil reefs (Stanley and Hardie, 1998). The thallus of Halimeda is constructed entirely of branching filaments that are matted together to form a plant body, which in some species may reach over a meter in length. Since no cross walls are produced in any of the filaments, the plant may be regarded as one giant, multinucleated cell. Despite its dominance today, the fossil record of Halimeda extends back only to the Cretaceous and possibly to the Triassic (Hillis, 2001; Dragastan and Soliman, 2002), although taxa with hali-mediform morphology are known from the Permian (Poncet, 1989). Several authors (Hardie, 1996; Stanley and Hardie, 1998; Knoll, 2003a) have correlated the rise and fall of certain calcareous organisms, including some green algae, with changes in seawater chemistry through time, especially the ratio of magnesium to calcium, Mg/Ca. Those organisms which deposit massive calcium carbonate skeletons (FIG. 4.16 ) and have weak physiological control over mineralization are most strongly affected by changes in seawater chemistry. This theory would explain the lack of Halimeda -type algae prior to the formation of "aragonitic" seas in the Late Jurassic-Cretaceous (Ries, 2005). In fact, the dasycladalean algae are the group which contributed most to carbonate rock formation in the Triassic. FIGURE 4.16 Calcareous (Extant). Bar = 2cm. algal survivors of the massive Permian-Triassic extinction. The species from the Yukon, I. triassica, is interesting because it displays sexual reproductive structures in the form of stalked spherical outgrowths from the thallus that are interpreted as oogonia, and dome-shaped protuberances thought to be male gametangia (Torres, 2003). Another uncalcified green alga, which morphologically resembles the existing genus Caulerpa, has been reported to be preserved in Miocene diatomite from California (Parker and Dawson, 1965). 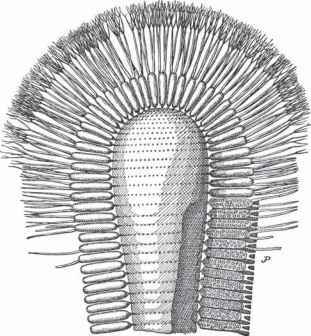 This fossil, Caulerpites denticulata, consists of a diffusely branched thallus with broadened, ultimate segments. Early fossils interpreted as uncalcified green macroalgae include Yuknessia and Margaretia from the Middle Cambrian Burgess shale of Canada and the Maq'um and Wheeler Formations in Utah (Walcott, 1919; Conway and Robison, 1988). Yuknessia simplex formed delicate, centimeter-sized thalli composed of unbranched or (repeatedly) dichotomizing erect cylindrical branches which arose from what appears to be a central holdfast. Thalli of M. dorus were threadlike, rarely branched structures up to 2 cm in diameter and probably up to 1 m long. Courvoisiella (FIG. 4.18) is a Devonian uncalcified green macroalga characterized by a comb-shaped thallus constructed of non-septate, branching tubes (Niklas, 1976a). Along some tubes are spherical structures about 200 pm in diameter that have been interpreted as some type of gametan-gium. Chemical analyses of the fossils confirm the presence of cellulose. These findings, along with morphological data, were used to suggest affinities with the green algae. Impression fossils of relatively large (<15 cm long), flat, sometimes lobed thalli have been described from the Mississippian Bear Gulch Limestone in Montana (Grogan and Lund, 2002), and the Namurian of Hagen-Vorhalle in Germany (Krings, 2005). Although it is difficult to determine the affinities of these fossils because they lack characteristic features, such as reproductive structures, they have been suggested as superficially resembling the thalli of the modern green alga Ulva lactuca (Ulvales) and the red alga Porphyra umbilicalis (Bangiales). Bubnoffphycos rhombeum , described by Daber (1960) from the Permian of Germany, may also represent an algal thallus comparable to these extant forms. Is A medusaegraptus A land plant?